The video.js community has been in full force lately and it’s resulted in a lot of great features and fixes, including UI updates, better error messages, and even a Video.js Polymer element built by Addy Osmani himself. Video.js has supported different forms of live video for a while, but a recent update has made the user experience a little clearer. Specifically, a ‘LIVE’ badge is added to the controls and the seek bar is hidden when seeking isn’t permitted. For developers, better logging functions have been added including videojs.log.error(), and they’re being used throughout the code base to provide better information and help track down issues. 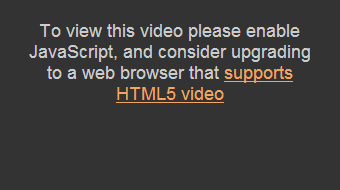 Video.js relies on native browser fullscreen even when Flash is used. IE11 is the first version of Internet Explorer to support native browser fullscreen, and video.js has now been updated to take advantage of that feature and provide a better fullscreen experience for those users. If you ever wanted to speed up or slow down the rate of a video, now you can! HTML5 video browsers have been adding support for playback rate switching, and video.js now has an optional UI component that will let you select the speed. Flash however does not support playback rate switching, so unfortunately it’s not a feature that users on older browsers (e.g. IE8) can use. The latest plugins to be added to the video.js plugins list. If you’d like a head-start on the scaffolding for a new video.js plugin, check out the Yeoman video.js plugin generator.